1. They make the material more meaningful by adding associations and creating patterns. In fact, mnemonics work better for material that is less meaningful. 2. They help organize the information so that you can more easily retrieve it later. By giving you associations and cues, mnemonics allow you to cross-reference the information in different parts of your memory. This mental structure is very useful for material that has very little inherent organization. 3. Mnemonics typically involve visualizations that help make the facts more vivid. This is especially helpful for people who are visual learners. Additionally, these visualizations help focus your attention on the material by making the learning more fun. 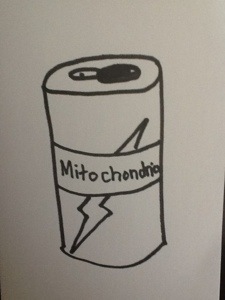 I made this with a student to help her remember the term “mitochondria” and to help her remember that the function of the mitochondria is to produce energy in the cell. Another memory aid that builds connections for a student is narrative, or story. I taught students the capitals of the provinces of Canada in less than half an hour. Ham up the stories, the funnier the better, and the more memorable! For a copy of this, click here. We tried another narrative. I put 10 items on a tray, students looked at the items for a minute, then I took the tray away. I asked them to write what they remembered. Next, I took out the tray and made a story in which I walked through my house and in each room I incorporated one of the items. For example, to remember: hat, tennis ball, book, juice box, sock, and calculator: I walked into my house and hung up my hat. Then I walked into the hallway and kicked a tennis ball that was left on the floor. I was frustrated so I went into the living room and sat down but I sat on a book. I quickly got up and went into the kitchen for a juice box. After that I went to the living room where I found my sock. I put it on and decided to get to work. I went into the dining room and sat at the table with my calculator. And so on… This method works best when your mental pictures are walking through rooms in your own house. Try it! Challenge someone that doesn’t know this trick and blow them away with your memory powers! These tools are definitely NOT just for special ed. students! Imagine the university student that has to memorize the parts and functions of a cell, list genres of literature, rattle off events in historical order, or recall different types of generators and how they function! Posted in Classroom, Home, Uncategorized and tagged capital cities, memory, Mneumonics, provinces. Bookmark the permalink. Easy Peasy and So Helpful! I explained that it is a gateway to getting somewhere that can otherwise be a challenge. Students took out iPads or iPods and looked to the setting for “Accessibility”. Once found, they turned on “Speak Selection”. Now, anytime browsing the web in Safari or looking at a word document they can highlight the text and one of the choices will be “Speak”. The text is read while individual words are highlighted. Click here for a copy of an instructional handout that I will present to my staff. 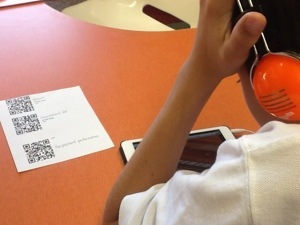 then made up QR Codes that students could scan with their iPod or iPad and be taken directly to websites. One website was a YouTube video of harpsichord playing, another had a definition of the harpsichord, and the third had a YouTube video of Mozart’s music. Pretty cool, right? Well, students were told that it is a good strategy to ask yourself questions before reading so that their mind is “in gear” and ready for the topic. I asked them to write some questions. Do only old people listen to this music? 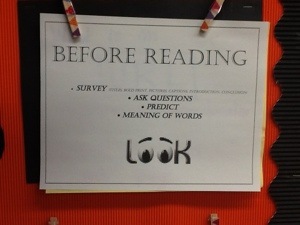 Click here for a copy of the Before Reading Poster. 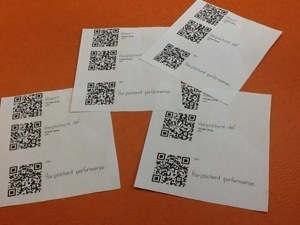 Posted in apps, Reading and tagged Preteaching, QR codes, vocabulary. Bookmark the permalink. Have you seen this document: The Ontario Curriculum Unit Planner: Special Education Companion ? 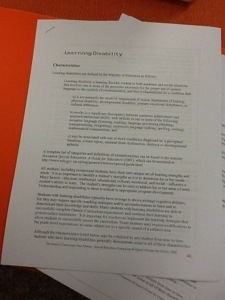 It has definitions of different disabilities and classroom strategies and suggestions. A really helpful resource! Posted in Classroom, Home, Kids and tagged classroom suggestions, definitions, Special ed document, strategies. Bookmark the permalink. Today some students read a short nonfiction passage, then scanned the question sheet that went with it, highlighted their answers right on their iPod or iPad, then emailed it to me. Students were so excited with this today! No pencil, just their iPod or iPad! AND they were gladly reading!! A win win. Posted in apps, Classroom and tagged Apps, scan, worksheet. Bookmark the permalink. As teachers we hear about home and no doubt home hears about teachers. As a parent and a teacher I can chuckle at many of the anecdotes my children tell me, usually seeing the bigger picture of where and how incidents are happening. As a teacher, the line between home and school can sometimes get blurry. For example, when a young student can’t stop talking about playing a rated “M” video game that I do not agree with and would not allow in my home. Or the student that brags about how late he goes to bed or how little sleep he gets. I want to respect and honour parents but I want to offer an opinion and observations as well. If I am to be influential in a child’s life, how do I walk this line? Posted in Classroom, Home and tagged Home, parent, school, teacher. Bookmark the permalink.